Reprint. Originally published: New York: Pantheon Books, 2012. In The Righteous Mind, psychologist Jonathan Haidt answers some of the most compelling questions about human relationships:Why can it sometimes feel as though half the population is living in a different moral universe? Why do ideas such as 'fairness' and 'freedom' mean such different things to different people? Why is it so hard to see things from another viewpoint? 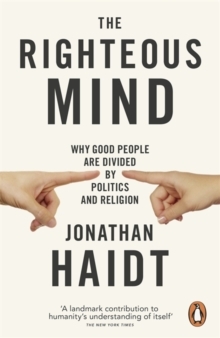 Why do we come to blows over politics and religion?Jonathan Haidt reveals that we often find it hard to get along because our minds are hardwired to be moralistic, judgemental and self-righteous. He explores how morality evolved to enable us to form communities, and how moral values are not just about justice and equality - for some people authority, sanctity or loyalty matter more. Morality binds and blinds, but, using his own research, Haidt proves it is possible to liberate ourselves from the disputes that divide good people. 'A landmark contribution to humanity's understanding of itself' The New York Times'A truly seminal book' David Goodhart, Prospect'A tour de force - brave, brilliant, and eloquent. It will challenge the way you think about liberals and conservatives, atheism and religion, good and evil' Paul Bloom, author of How Pleasure Works 'Compelling . . . a fluid combination of erudition and entertainment' Ian Birrell, Observer'Lucid and thought-provoking ... deserves to be widely read' Jenni Russell, Sunday TimesJonathan Haidt is a social and cultural psychologist. He has been on the faculty of the University of Virginia since 1995 and is currently a visiting professor of business ethics at New York University's Stern School of Business. He is the co-editor of Flourishing: Positive Psychology and the Life Well Lived, and is the author of The Happiness Hypothesis: Finding Modern Truth in Ancient Wisdom.